We’d love your help. Let us know what’s wrong with this preview of Pea's Book of Best Friends by Susie Day. When Pea Llewellyn's dizzy but dazzling single mum becomes Marina Cove, author of the bestselling Mermaid Girls books, everything changes. It's time to leave their tiny flat in Tenby for a proper house in London, and a whole new life. Pea likes the red front door, and the attic bedroom all to herself. She even likes her hideous new school uniform, in a masochistic Malory To When Pea Llewellyn's dizzy but dazzling single mum becomes Marina Cove, author of the bestselling Mermaid Girls books, everything changes. It's time to leave their tiny flat in Tenby for a proper house in London, and a whole new life. To ask other readers questions about Pea's Book of Best Friends, please sign up. Pea and her sisters Clover and Tinkerbell are moving from their tiny, mold-ridden flat in Tenby, Wales, all the way to a beautiful new house in London, for an unusual reason: their mother, a sweet but flaky writer, has suddenly exploded into literary celebrity with her new series The Mermaid Girls! She's publishing under the pseudonym of 'Marina Cove'. That means that the girls are dealing not just with their lives turning inside-out, but with two disconcertingly different versions of their own Pea and her sisters Clover and Tinkerbell are moving from their tiny, mold-ridden flat in Tenby, Wales, all the way to a beautiful new house in London, for an unusual reason: their mother, a sweet but flaky writer, has suddenly exploded into literary celebrity with her new series The Mermaid Girls! She's publishing under the pseudonym of 'Marina Cove'. That means that the girls are dealing not just with their lives turning inside-out, but with two disconcertingly different versions of their own mother: the "Mum" they've always known and the "Marina" that girls all over the country are suddenly obsessed with, who is glamorous and not at all the same. Worse yet, the original three "mermaid girls" of Marina's books were based on her own daughters...and the one based on Pea has now turned evil AND died! What does that mean? Really, Pea thought, there was no such thing as a normal family; just yours, and everyone else's. And that really sums up the loveliness - and the quirkiness - of the book in so many ways. 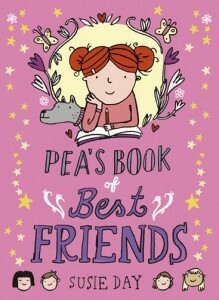 Really, my only criticism of this entire delicious novel is its title - Pea's Book of Best Friends sounds a little bland to me, and doesn't give any hints of the total wackiness, charm and hilarity of Pea's family and their new friends and acquaintances. Here's what I really want to say: If you love The Penderwicks, Ballet Shoes or Hilary McKay's Casson Family series, READ THIS BOOK! You will love it, I promise. I really, really did. It's not often that I come across a book that fills me with this kind of missionary zeal - but I read it with such utter delight, I want to give copies of it to everybody I know. It's just that kind of book! I actually think there's a bit of a quiet revolution going on at the moment for the under ten market. I've been reading a lot for this age demographic recently and have been really loving the idiosyncratic quality of practically everything I've read. These books aren't churned out by factories, or written by committee; these books are written by funny, charming and highly unique authors. I mean, if you showed me a paragraph from say Alex T Smith or Maudie Smith(no relation!) or Jacqueline Harvey I actually think there's a bit of a quiet revolution going on at the moment for the under ten market. I've been reading a lot for this age demographic recently and have been really loving the idiosyncratic quality of practically everything I've read. These books aren't churned out by factories, or written by committee; these books are written by funny, charming and highly unique authors. I mean, if you showed me a paragraph from say Alex T Smith or Maudie Smith(no relation!) or Jacqueline Harvey or Lauren St John, I bet you could very easily identify who wrote what. I love that. I love that we've come to a stage of having books that are uniquely written for this age demographic and that they're GOOD. They're all so flipping good! And I really really love that I can now add Susie Day to that list. Pea's Book of Best Friends doesn't quite have the right title for what it is. I sort of expected a bit of a Junior Mean Girls type thing but what I got is a gorgeously quirky, funny, crumpets toasted by the fire sort of book. It's so lovely. Pea's mum is Marina Cove, author of the famous Mermaid Girls books. And now, because she's doing really well, she's bringing Pea and her sisters through to London. That means Pea has to start a whole new life, one where she's not automatically getting the hand-me-down clothes and one where she's not got a best friend. Her sisters aren't that happy either - and so begins the great "ex-merminating" project where the sisters decide to exterminate the mermaid books that have brought them to London and so go back to their former lives. And Vittoria, over from Brazil and living with the family in order to improve her English, steals practically every scene she's in. Innit. I thought this book was amazing. I enjoyed every single bit of it; but if I had to pick my favorite part it would have to be when Pea made friends with Sam1. Pea was easy to relate to and showed that good friends can be found wherever you are. My Favorite character was Sam1 because he is kind and generous (always good things to have in a friend). I also liked Pea as she is hard working and brave. Although I didn't like Sam 2 who is, in contrast to Sam1, a mean and selfish pig. Hey guess what I adore contemporary middle grade stories about big creative families. This is an excellent one. I love everybody in this townhouse. This isn't my usual kind of book: it's the younger end of MG, it isn't fantasy, there's no big adventure story, and it's pink *gasp*. BUT... I absolutely fell in love with Pea's Book of Best Friends, so much so that I instantly rushed off and bought the next two books in the series. It is that unusual thing: an absolutely happy-making book, the kind that makes you just want to hug yourself when you've read it. The characters are brilliantly drawn and loveable, their lives are gripping despite th This isn't my usual kind of book: it's the younger end of MG, it isn't fantasy, there's no big adventure story, and it's pink *gasp*. BUT... I absolutely fell in love with Pea's Book of Best Friends, so much so that I instantly rushed off and bought the next two books in the series. It is that unusual thing: an absolutely happy-making book, the kind that makes you just want to hug yourself when you've read it. The characters are brilliantly drawn and loveable, their lives are gripping despite their problems being fairly 'normal', and oh did I mention it's HILARIOUS? It made me burst out laughing numerous times. Just a quick review for this super cute little read. In short I loved it. It was funny and sweet and I loved all the characters you come across in this book from the main character Pea through to the entire host of secondary characters you meet. For me this book was about finding a friend and what it means to be a friend and finding that friendship in unexpected places and I loved it for that. I also particularly loved the way the book dealt with unusual family set ups as the norm and embraced t Just a quick review for this super cute little read. I also particularly loved the way the book dealt with unusual family set ups as the norm and embraced the diversity of the different characters within the story. This is so needed in children's books in order to make children see that there isn't such as a normal family and that diversity should be embraced and celebrated. This is a great book for kids. It has a story they can identify with and shows how one family copes with moving house and all of the problems (and joys) that can entail. It's a really well written book and avoids being patronising. The characters are great. My favourite was Tinkerbell who is not like her name (probably why I like her so much). Highly recommended. This and the others in the Pea's book series are my absolute favourite books to read with my daughter. Sensitively and humorously deals with life's challenges for older children, through the life of an unconventional family. I really really like " Pea's book of best friends "I really would read it if you have not , a perfect book if you like a mystery !! My best character is clover she is funny but in a serious way !!! Very very very very very very good . A hugely entertaining read, spot-on for girls of 8/9+ ! Pea's Book of Best Friends is funny and totally engaging. My daughter and I both loved it! Super 8+ read. Fun quirky characters and a warm family you instantly want to be part of. Fabously brilliant book about trying to find a real friend.